Out of thousands of stocks that are currently traded on the market, it is difficult to identify those that will really generate strong returns. Hedge funds and institutional investors spend millions of dollars on analysts with MBAs and PhDs, who are industry experts and well connected to other industry and media insiders on top of that. Individual investors can piggyback the hedge funds employing these talents and can benefit from their vast resources and knowledge in that way. We analyze quarterly 13F filings of nearly 750 hedge funds and, by looking at the smart money sentiment that surrounds a stock, we can determine whether it has the potential to beat the market over the long-term. Therefore, let’s take a closer look at what smart money thinks about Martin Marietta Materials, Inc. (NYSE:MLM). Martin Marietta Materials, Inc. (NYSE:MLM) shareholders have witnessed an increase in hedge fund sentiment in recent months. 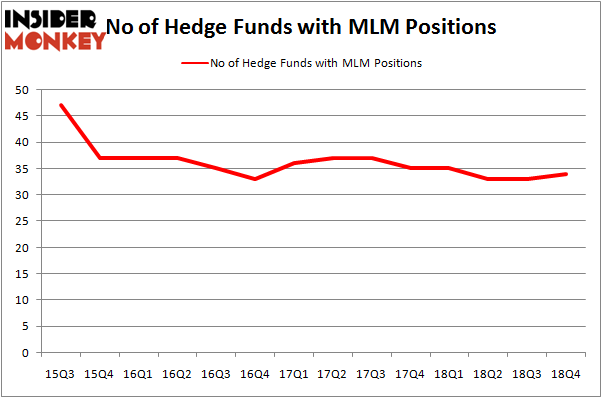 Our calculations also showed that MLM isn’t among the 30 most popular stocks among hedge funds. Let’s take a gander at the key hedge fund action regarding Martin Marietta Materials, Inc. (NYSE:MLM). 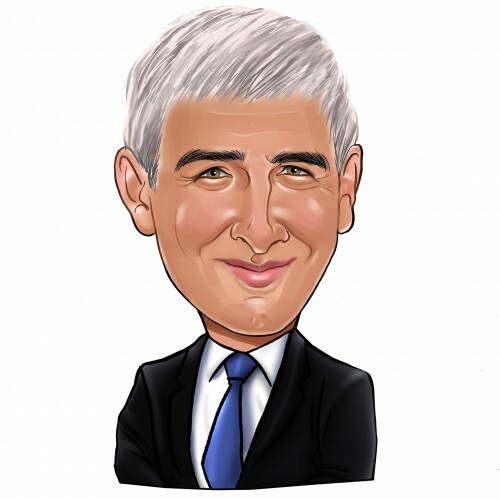 What have hedge funds been doing with Martin Marietta Materials, Inc. (NYSE:MLM)? At the end of the fourth quarter, a total of 34 of the hedge funds tracked by Insider Monkey were long this stock, a change of 3% from one quarter earlier. By comparison, 35 hedge funds held shares or bullish call options in MLM a year ago. With hedge funds’ positions undergoing their usual ebb and flow, there exists a select group of noteworthy hedge fund managers who were adding to their stakes considerably (or already accumulated large positions). Among these funds, Select Equity Group held the most valuable stake in Martin Marietta Materials, Inc. (NYSE:MLM), which was worth $527 million at the end of the third quarter. On the second spot was Gardner Russo & Gardner which amassed $334.3 million worth of shares. Moreover, Egerton Capital Limited, Iridian Asset Management, and Soroban Capital Partners were also bullish on Martin Marietta Materials, Inc. (NYSE:MLM), allocating a large percentage of their portfolios to this stock. As one would reasonably expect, some big names have jumped into Martin Marietta Materials, Inc. (NYSE:MLM) headfirst. Egerton Capital Limited, managed by John Armitage, assembled the most outsized position in Martin Marietta Materials, Inc. (NYSE:MLM). Egerton Capital Limited had $269.6 million invested in the company at the end of the quarter. Eric W. Mandelblatt and Gaurav Kapadia’s Soroban Capital Partners also initiated a $159.8 million position during the quarter. The other funds with new positions in the stock are Matt Simon (Citadel)’s Ashler Capital, Eduardo Abush’s Waterfront Capital Partners, and Jos Shaver’s Electron Capital Partners. Let’s also examine hedge fund activity in other stocks similar to Martin Marietta Materials, Inc. (NYSE:MLM). These stocks are CarMax Inc (NYSE:KMX), Lamb Weston Holdings, Inc. (NYSE:LW), iQIYI, Inc. (NASDAQ:IQ), and Wynn Resorts, Limited (NASDAQ:WYNN). This group of stocks’ market caps match MLM’s market cap. As you can see these stocks had an average of 32.75 hedge funds with bullish positions and the average amount invested in these stocks was $1243 million. That figure was $1960 million in MLM’s case. Wynn Resorts, Limited (NASDAQ:WYNN) is the most popular stock in this table. On the other hand iQIYI, Inc. (NASDAQ:IQ) is the least popular one with only 25 bullish hedge fund positions. Martin Marietta Materials, Inc. (NYSE:MLM) is not the most popular stock in this group but hedge fund interest is still above average. This is a slightly positive signal but we’d rather spend our time researching stocks that hedge funds are piling on. Our calculations showed that top 15 most popular stocks among hedge funds returned 19.7% through March 15th and outperformed the S&P 500 ETF (SPY) by 6.6 percentage points. Unfortunately MLM wasn’t in this group. Hedge funds that bet on MLM were disappointed as the stock returned 12.8% and underperformed the market. If you are interested in investing in large cap stocks, you should check out the top 15 hedge fund stocks as 13 of these outperformed the market. Activist Keith Meister Says This Year’s Market Rally and Last December’... Is Vulcan Materials Company (VMC) A Bargain According To Hedge Funds? Here’s What Hedge Funds Think About Principal Financial Group Inc (PFG... Here is What Hedge Funds Think About Flocking Into ZTO Express (ZTO) Is Liberty Broadband Corp (LBRDA) A Good Stock To Buy? Is CNH Industrial NV (CNHI) A Good Stock To Buy?